These are the most common statements Allison Gleason hears from women right after their first mammogram. They’re relieved and usually feeling a little silly about having been afraid of the screening in the first place. But fear is a common cause of women holding off getting their first mammogram. 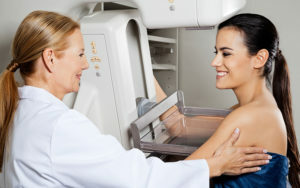 A normal breast cancer screening consists of four pictures – two from side views and two from the front view, and the mammogram itself takes less than 10 minutes, Gleason said. The images should get everything from the clavicle to the middle of the chest. There are some questions to answer and some paperwork to fill out beforehand, so the whole thing takes about 20 minutes. A key thing to understand is it should not hurt. It is uncomfortable – after all, the machine compresses the breasts to see through the layers of tissue, Gleason said – but it shouldn’t be a painful experience. “If you’re experiencing pain, you should definitely say something so the tech can adjust what they’re doing,” Gleason said. At OSF Saint Anthony, she added, the team is very sympathetic to women who are going through their first mammogram and are scared. The Women’s Center team also offers to call patients as soon as possible to let them know the results. For women who get the test done in the morning, that call can come as early as that afternoon, providing quicker peace of mind for women who are scared of the uncertainty of not knowing what the test revealed. It is recommended for women to get screened for breast cancer annually beginning at age 40. Screening is vital to catching breast cancer early, before it can spread. When breast cancer is detected early, treatments for the disease are less invasive and typically lead to better outcomes. Visit our breast health page to learn more. Ken Harris is a writing coordinator for the Marketing & Communications division of OSF HealthCare. He has a bachelor's in journalism from the University of Wisconsin-Madison and worked as a daily newspaper reporter for four years before leaving the field and eventually finding his way to OSF HealthCare. In his free time, Ken likes reading, fly fishing, hanging out with his dog and generally pestering his lovely, patient wife.